Fabulous racer needs new home. This car is a serious racing weapon. Built and raced late 60’s early 70’s – SCCA C-Sedan. Recommissioned to run in SVRA and VDCA in 2004. Not raced since 2009. 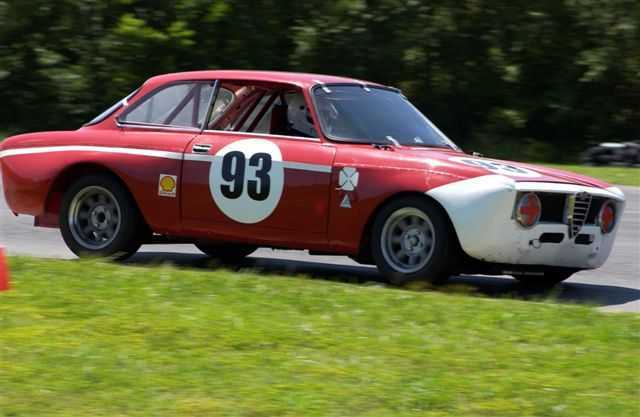 This step-nose coupe is Chassis number AR 6 16012, which makes it a Tipo 105.02 – a 1965 Giulia Sprint GT. At some point during its life as a racer GTAm style wide-body fenders were added. In the early 2000’s, after a long period of dormancy this car was acquired by Judge Parker Racing and sold to its current owner who set about recommissioning the car. SVRA log book included. This car is equipped with lightweight fiberglass fenders. Sadly, we have no documentation to confirm the history of this car, but all evidence points to the fact that this is a well developed old race car. I drove a few laps around VIR in this car and can attest to its solid feel and performance potential. No expense was sparred in the restoration of this racing machine. This car is in impressive condition. It is equipped with a very high reving 1300cc engine, it is one of the faster Vintage Group 1 cars you can find. GTA style Montreal brake calipers. Vented (GTA/Montreal) rotors. Recently rebuilt. Autodelta – drop front spindles. Original Alfa oil Temp and oil pressure gauges. Ford T-5 close ratio five speed gearbox. Please feel free to call the shop if you have any questions..